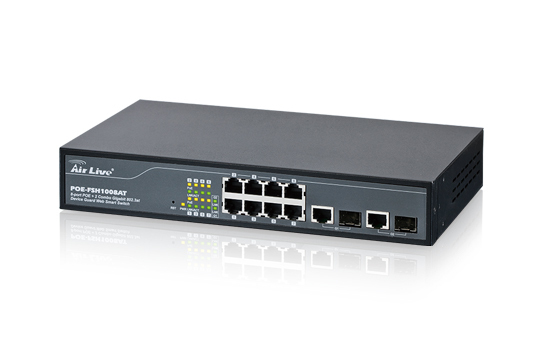 The POE-FSH1008AT is a 10-Port web smart switch including 8 PoE ports and 2 RJ45/ SFP uplink ports. Each PoE Port can provide up to 30W output which is 802.3at/af output standard. With the standard 802.3at/af PoE function, the PoE-1008AT can power any standard 802.3at/af IP cameras or access point. Moreover, it provides the remote management function including enable/ disable the PoE output, VLAN, Bandwidth Control, Trunking, Broadcast Storm Control and Device Guard. Device Guard is a state-of-art function introduced by AirLive. It allows PoE Switch to monitor whether IP cameras or access point crashed. If the device guard switch detect the PoE devices crashed, it will repower the PoE devices, in order to let the devices work normally. This function reduces the needs for expensive after servicing cost and time. Because normally, the IP cameras or access point are installed in the place which is not easy to reach. After enable and set up the Device Guard function in the switch, the POE-FSH1008AT can monitor PoE IP Cameras and Access Points for activities. When a device crashed and not responding, it will reboot the device automatically. It keeps your wireless and IP camera network running smoothly without the need to send expensive technician for service.